I hope you’ve found the Makeup Brush Collective Part 1 and Part 2 helpful or at least enjoyable! In Part 3, and the final part, I show you the brushes I use most often and the types of brushes I use for cheeks. While in this category there’s usually reference to bronzer, blush and highlighter, I only really use blush the most often. So, I’ll only show you that. I don’t use bronzer, and highlighter is used only sparingly. Blush is a weakness of mine, and you’d think that this would be the category where I own or use the most brushes. Well, you’d be wrong actually, because I’d actually worked out quite quickly what worked and what didn’t for me, and what sort of brush I preferred! Also, I’m not very experimental when it comes with blush LOL! Blush brushes I use fall in 2 categories. I know, you’re wondering how complicated applying blush can be. Well, it isn’t complicated at all. I have 2 categories, because I experimented a lot in the early days, and I’ve got brushes from both categories to use – and they yield slightly different results! I actually started out my blush brush collection with the Ecotools Bamboo Blush Brush, and you know what? It’s still going strong! It’s now a little more dense than what I like so I usually pull it out when I’m working with blushes that aren’t as pigmented as I like, where softer brushes may not be able to pick up the colour as well. In this category of flat and fluffy blush brushes, I find that my preferences tend to lie to these, when I’m working with blushes that I need precise placement with. Brushes like the Wayne Goss #2 and Hakuhodo B505BkSL are beautiful for this purpose. They get the colour just exactly where I want it to go, and then, they’re soft enough that I can blend it out to a diffused finish. These brushes are exceptionally useful if you want to apply a stripe of colour along your cheekbones, due to the shape of the brush. With both these brushes, it took me a while to decide if I’d like them, because they are both a little more dense. This means also that they can pick up a little more colour, so I have to be careful when working with softer or more pigmented blushes. However, I also find that they buff out colour beautifully, so I just merely tap the brush on the blush, apply where I want it to go, and then blend it out. Works like a dream! The Lunasol Cheek Brush N was one I loved and still love. I even declared it to be the only brush I ever needed. Well, that’s true if you don’t have a roving eye like I do. But I’d also come to accept that because it is so beautifully soft, it can be a little softer than I like. It works well with Japanese brand blushes and blushes that are super pigmented, because you can pick up a sheer amount of colour. But sometimes, you need something a little more. 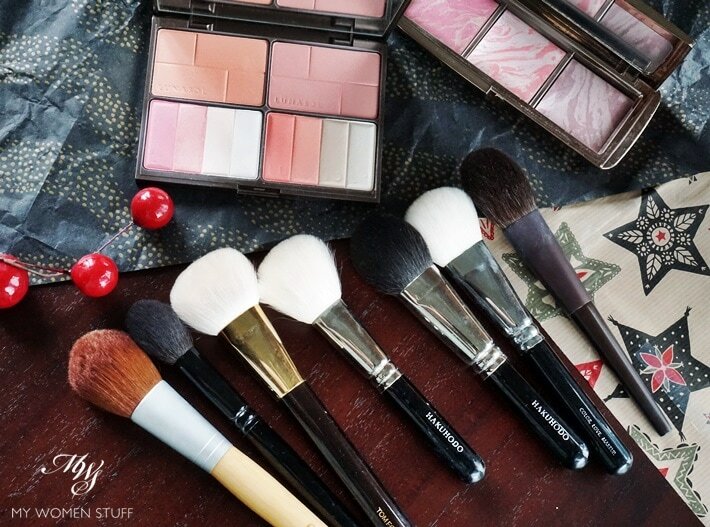 TIP: When it comes to makeup brushes, softer does not necessarily mean better. Sometimes, you need a denser brush (not scratchier, but denser) and sometimes, you need a fluffy, very soft and pliable brush. They serve different purposes, as I’ve learned over the years, which means that some of my super soft brushes no longer see the light of day as they don’t serve my purpose as well as I thought they did. The Zoeva #126 and Hakuhodo J110 are both very soft and fluffy, which I find makes them very lovely for blending out colour. However, they both are a little more splayed out, so they tend to cover a wider area. If you have a small face, then the Hakuhodo J100 may be a little too large. For me, it’s alright, but I do find that they cover a wider area, and offer less precise blush placement. It’s nice for a more neutral, sheerer blush shade that I’d like to just quickly blush on without thinking too much about. But if it’s a stronger shade, I prefer not to use these brushes, for fear of looking over-done. The Tom Ford #06 should really fall into the next category. It’s round, dense and fluffy so I’ve no idea what it’s doing in here LOL! But it’s a very lovely brush, that’s soft as air on skin, and picks up colour very easily. The soft yet dense bristles also diffuse the colour well, and it is a little more precise in terms of product application on the apples of the cheeks. Round brushes like these are a new addition to my blush brush collection. I only discovered them rather by accident when I bought the Hakuhodo and Make Up For Ever one, but I like how the heads are medium sized, and they allow for a beautiful application of blush on the apples of your cheeks. My favourite brush in this category is the Make Up For Ever #152 brush, which comes as a surprise because it is a synthetic brush and my preferences, as you can tell, lie with the natural hair brushes. I bought this one because I had readers tell me I just HAD to check it out, and you are right – I love it! The brush is so soft because it’s synthetic, yet the head is so dense that it picks up colour very easily from any type of blush. I don’t have to worry about the blush being too hard or too soft. It picks up colour so easily. It can also mean of course that if you have a very pigmented blush, you can pick up too much colour, so adjust accordingly. What I really like about the MUFE #152 brush is how it diffuses and applies the colour on my skin. I love using it especially with blushes that are less pigmented, because it picks up colour so well. Then, I deposit the colour on cheeks and blend it out in a circular motion. It’s a beautiful brush that is well made and a dream to use for everyone, including newbies! I also like how it buffs out shimmer to a lovely shine on the skin, without making it look excessive. The Hakuhodo J210BkSL is the natural hair counterpart, and is significantly softer. What this means, as I’ve illustrated above, means that it has more flex. It’s not a bad thing, but it also means that if you’re working with very light coloured blushes, you may need to build up colour a little more. If you’re working with pigmented, deeper colours, then it’s easier to get a more natural flush. The Zoeva #102 brush is a one-off for me as I use it only with cream blushes (or liquid or gel blushes as you prefer). I realise you can apply cream blushes with fingers, but I prefer using this technique, that gets me a more flawless, natural finish. The synthetic bristles mean it’s easier to clean and doesn’t stain from cream blushes, and the density of the brush (which is like a kabuki brush) makes it easier for me to spread and buff out the colour to a more natural finish. The synthetic bristles are also soft, so it doesn’t irritate my skin when I buff out colour. I don’t use bronzer, but when I do (very very rarely) I either use the Wayne Goss #2 brush, or the NARS bronzer brush which is big, fat behemoth that I like because it can offer a more natural effect. When I use highlighter, which is also quite rare, I also reach for the Wayne Goss #2 brush or the round brushes – MUFE #152 or Hakuhodo J210BkSL that have a smaller head to allow for greater control. I also sometimes use the Hakuhodo B505BkSL if I want a precise application of the highlighter, as it can deposit colour a little strongly. And this concludes the Makeup Brush Collective! What is your favourite blush brush or types of blush brushes? So, my advice to you is to work out the TYPE of brush you like to use and then look for a brand that’s within budget. I went crazy over buying brushes once, even indulging in some crazy expensive ones. I’m glad I woke up from that addiction! 😀 Now, what’s your favourite blush brush? I had a feel of the Surratt brushes in Singapore last year. Very nice. But the price. Floored me! 😛 Also copped a feel of Suqqu once too, but couldn’t bring myself to spring for it. I guess that’s when I knew I’d hit my limit haha! But like you, the brush I use depends on the blush as well. Some brushes pick up too much colour, so it’s too risky using them with pigmented blushes. 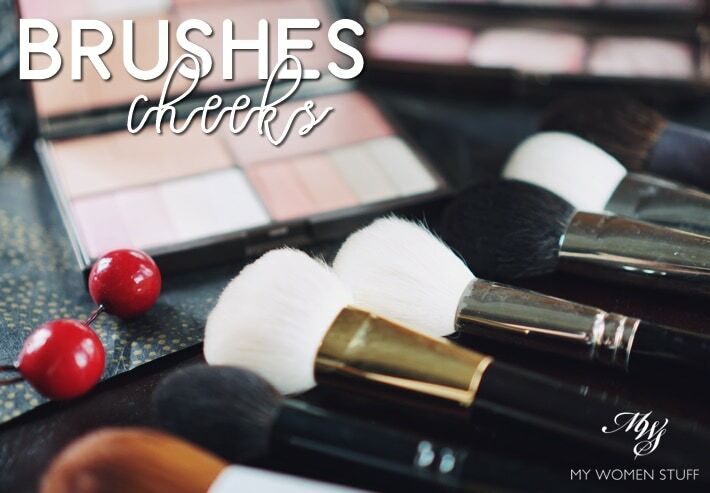 Blush brushes my weakness! I’m always on the lookout for brush shapes that I do not have yet. I have them in various shapes and sizes and hair types. Small dome shaped ones used to be my favourite shape for blushes so I have quite a number of them. But nowadays I find myself reaching out for flatter shapes more. I adore B505 and B5521 ( Hakuhodo version of WG02, which I much prefer to WG02) for the same reasons you have. Suqqu cheek brush is a magical brush… It gives an airbrush, blush from within effect to any blush. I’ve also come to enjoy using tongue-shaped brushes, among which my favourite is Koyudo BP017. For blushes that I use to contour my cheeks, I like to use angled brushes. For cream/liquid blushes, I’ve using small stipple brushes like G5555/G5556. I find brushes like that apply the product more evenly than fingers and are able to diffuse the product better yet without blending the colour. The TF cheek brush, though, is one brush I’d never mastered. ? Helloo! Dropping in to say hi after forever. 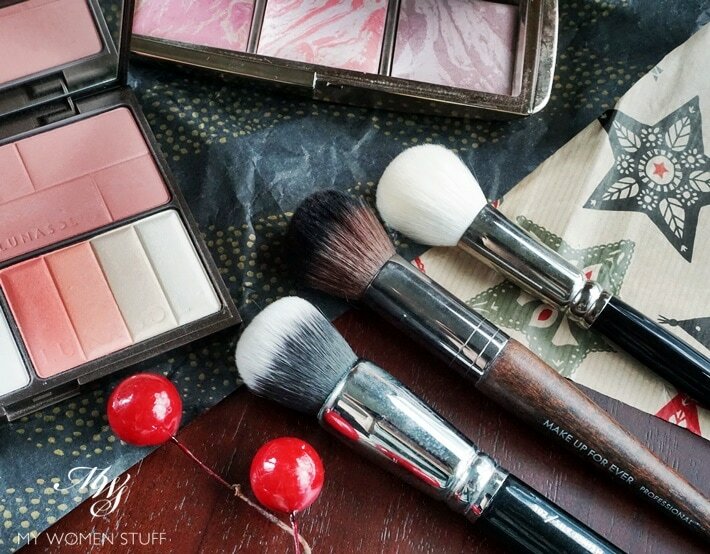 And so pleased to be reading about blushes and brushes, some of my fave makeup stuff. My fave blush till now is an Ecotools brush that is from their mineral brush set (from yonks ago), but works really well for blush. PS: Your blog is as pretty and awesome as ever!